I have been cooking for years and last night was the first time I ever tried cooking with panko bread crumbs. We see them being used on all of the food shows but have not really ever payed close attention to them. I made Crispy Baked Rosemary-Garlic Chicken Legs for dinner last night. The recipe called for panko and for the first time, I did not substitute regular bread crumbs. I actually went to the store and bought them. WHAT A DIFFERENCE! These chicken legs were so light and crispy. Definitely will be the bread crumb of choice for baking and frying meats and vegetables. After we finished dinner, Kevin suggested I write a "Did you know..." about panko. So as they said in the old days, I let my fingers do the walking. After some quick internet research, I found some interesting information on panko. Panko is variety of bread crumb used in Japanese cuisine as a crunchy coating for their fried foods. Panko is made from bread without the crusts. Using bread without crusts add a crisper, airier texture than found in most western bread crumbs. It also absorbs less oils than the regular crumb. This research also prompted me to type Panko in the search bar on Recipezaar and, you guessed it, up came a few recipes for panko. Last night I bought an 8-ounce box last night that cost $2.89 at the grocery store. More than double the price of larger container of regular bread crumbs. After reviewing the recipe below, I doubt anyone will ever need to purchase these again. I will guarantee the next time I need panko, I will be making my own! 1. Preheat oven to 300˚. Cut all crusts off the bread. 2. Push chunks of white bread through the shredding disk of a food processor to make coarse crumbs. 3. Spread the crumbs on a baking sheet and bake at 300 F degrees until the crumbs are dry but not toasted, about 6 to 8 minutes. Shake the sheet twice during baking. Be careful not to let the crumbs brown! 4. Immediately remove bread crumbs from oven and allow them to cool. 5. Once cooled, crumbs may be stored in the freezer, in a re-sealable plastic bag for as long as several months. My lithuanian grandmother would make these crisp, deep-fried pastries. She did not make them often but when she did, they did not last long. Each one of my family members had certain favorites that my grandmother would make each birthday. These cookies were one of my mom's favorite. I decided to make these as a treat for my mom's birthday since my grandmother passed away. All these years I had thought that rosettes were of polish descent. However, researching their origins for this blog entry uncovered that they are originally from Scandinavia. 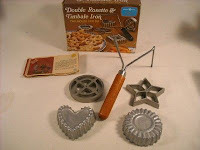 The rosette cookies are made with an aluminum mold that can be round, star-shaped, cup-shaped, or flower-shaped. The iron is heated in the oil, dipped in the batter and then back in the oil to deep-fry until a light golden brown. While it looks like many steps, these are VERY easy to make. 1. Add sugar to slightly beaten eggs, then add milk. 2. Sift flour before measuring, then together with salt. 3. Stir into first mixture until batter is smooth and about the consistency of heavy cream. 5. Heat fat or oil to 375°F in a deep kettle. 6. If you do not have a thermometer, put a small piece of bread into fat and count to sixty. Bread should brown. 7. Dip your iron into hot fat to heat it and drain excess fat on absorbent paper. 8. Dip heated iron into batter to about 3/4 its height. 9. If iron is properly heated and drained the batter will coat the iron. 10. If batter does not adhere the iron is too cool or greasy. 11. Plunge batter-coated iron quickly into the hot fat and cook from two to three minutes or until active bubbling ceases. 12. Invert iron over fat to drain fat off, then remove rosette from iron onto absorbent paper, inverting rosette to drain completely. 13. Your rosette should be crisp as soon as it is slightly cool. If it is not, your fat may be too cool. 14. If rosette does not drop off form easily, tap the form sharply with a knife handle to loosen it. 15. Let sit until completely cool. Then sprinkle with confectioners' sugar. I prefer letting them sit overnight in an air-tight container. Then, sprinkle with confectioners' sugar before serving. Crevices may also be filled with raspberry jam (or your favorite) prior to coating with the sugar. This past weekend we were in Chicago to visit my mom and aunt for their birthdays. Our plan for Saturday was to visit an open-air French market. The market is located in the downtown area. It has about 40 vendors selling everything from cheeses, meats, breads, produce, and packaged goods. Early Saturday morning, my aunt (Meenor), sister (Michelle)and mom (l to r) met to begin our day. We packed the car with empty shopping bags and began our adventure. I think I can honestly say, we were giddy with excitement. Well maybe not giddy but certainly very excited to be spending time with family whom I love and don't get to see enough of. We decided that our plan of attack would first be a walk through to scope out the merchandise. Within the first three vendors, we lost my mother who was now three vendors ahead waiving her credit card. This was going to be an expensive day. Somewhere between the first and second aisle, my sister disappeared when she spotted one vendor who was making fresh crepes. With two down, my aunt and I were determined to stick with the plan. So, we stopped at the coffee booth to fuel up and continued on our journey perusing the wares. The market also contained a few vendors who prepared food for one to sit down and eat. There was Mexican, which offered an interesting breakfast tacos with eggs, potatoes and chorizo. One vendor sold Belgian fries with dipping sauces. There was a deli for sandwiches along with vendors making curry and asian. Some of the favorites included a vendor who specialized in breads. We purchased a cheddar/bacon foccacia, an artichoke/mozzarella/basil/tomato foccacia, and a great loaf that was stuffed with cheese and sundried tomatoes. The three breads were about $20.00 but well worth it. This bread was ph-en-om-on-al! My mom and I were comparing leg of lamb roasts in the picture to the left. here was a meat counter that specialized in grass-fed meats. We saw filet-mignon that was $29.99 per pound. These filets were approximately 6-inches in diameter and 3-inches thick. They were the most gorgeous, ruby-colored steaks I have ever seen. They had a cheese monger that offered cow's milk, goat's milk, and even a water-buffalo cheese. Unbelievable sausages and seafood. Way too hard to do justice to them all. All in all, I would say that this open-air market was a great experience and very similar to the market in Milwaukee only slightly larger. The market is located 131 North Clinton, Chicago, IL. For information, you can find them on the web at www.frenchmarketchicago.com . Thank you so very much for your loyal support! I will be offline until Monday because not one, but both of our home computers are out of commission due to viruses! Gotta love technology. My good friends in the IT world are currently fixing them and we should have them back on Monday. Please stay tuned for Monday's blogging because we are going down to Chicago to visit my mom and aunt for their birthdays. We will be visiting an open-air French market, http://www.frenchmarketchicago.com/ and a few restaurants. I should have some great stories to share! I would also like to wish my mom (January 18) and my aunt (Meenor - January 15) a VERY happy birthday! Ready to tie up that roast? Want to make a bouquet garni? Oh wait, you find that you are out of kitchen twine. I found a great substitue in the January/February 2005 issue of Cook's Illustrated magazine. Dental floss makes a great substitute when you find you have no kitchen twine. Just make sure that you use unflavored, unwaxed dental floss. As most of you will know, my dream is to open up a diner of my own. The show Diners, Drive-Ins, and Dives has #1 priority on the DVR. Since the show started, three episodes were filmed in Wisconsin restaurants. Two were in Milwaukee and one in Kenosha. The Comet Cafe was the second diner to be visited by Guy Fieri and the crew of "The Triple D". The diner is located on Farwell Avenue on Milwaukee's eastside. Both Kevin and I have been dying to go there to try one of their specialties. Yesterday, we went there with our friends Linda and Dave. The Comet is known for serving everthing with bacon. At 5:30 p.m., if you are sitting at the bar and order a beer, the bartender will not put down a basket of popcorn or nuts, but a basket of bacon. That's right, buckets of unending bacon on the bar! Can life get any better? Well, as you would expect, it could get better. The Open-Faced Meatloaf stands about 7-inches high and is comprised of two slices of homemade caraway rye, a thick slab of meatloaf baked in a bacon-lined loaf pan, a heaping scoop of bacon dripping infused, homemade mashed potatoes, two strips of bacon, two slices of tomato, grilled onions, all smothered in hot gravy. This was one of the best meatloaf sandwiches that I have ever had. But, with all of the bacon involved, how could it not be? As you can see by the glazed look on my face, I was definitely enjoying the sandwich. Flavor of the meatloaf of just like "Grandma" used to make and the mashed potatoes were delicious. The gravy was just a bit salty but terrific nonetheless. Next time we will try the AJ's Compact Turkey Dinner, soft-ball sized croquettes of turkey, stuffing, and mashed potatoes deep-fried and smothered in gravy. If you are ever on the east side of Milwaukee and looking for a quick bite to eat, I would definitely recommend the Comet Cafe, www.thecometcafe.com/ . And, if you have a thirst to quench, I would suggest getting the Beermosa, a specialty white beer combined with orange juice. One would not think it would taste good, but this little cocktail on a warm sunny afternoon would go down VERY smoothly! Last night Kevin and I had the opportunity to attend the retirement party of a good friend. Well, as one would expect, we had a few cocktails. Nothing is better the morning after a night out than a hearty breakfast to soak up the night's indulgences! I ran across this pancake recipe a few years ago and it has been my fall back ever since. Once you try these you will never stray. This recipe caught my eye because of the buttermilk and the sour cream. I hope you enjoy these as much as we do. This is always a staple when we have overnight guests at the cabin. If you do not have buttermilk on hand, simply add one tablespoon of lemon juice to every cup of milk used. Also, I typically use about 3 tablespoons of sugar when I prepare these pancakes. 1. In a large bowl combine the flour with the next 4 dry ingredients. 3. Allow to stand at room temperature for about 5-8 minutes. 4. Before frying whisk/mix again, then drop about 1/3-cup onto a medium-hot greased skillet; cook until lightly browned on the bottom, then turn and cook until browned. Pancakes are one of the best breakfast foods ever. But, like waffles, the first ones of the group always get cold or dried out. And as you will probably guess, tomorrow's post will be THE BEST pancake recipe ever. Whenever I make pancakes this recipe is always requested. Thick and bubbly but as light as a feather. Most of the oven set at the lowest temperature will keep pancakes hot. But, do you ever find that the finished pancakes dry out by the time you get to the end of the batter? As shown in photo #1, place a heat-proof dish over a pan of simmering water. As you finish cooking each batch of pancakes, place them on the hot plate as see in photo #2. You can also lightly drape a piece of follow over the top as well. 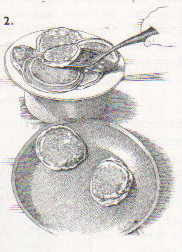 This great method for keeping the pancakes warm was shared in the January/February 2007 issue of Cook's Illustrated magazine. The flavor of the filling was great. I did add a pinch of cayenne pepper. I would spray the baking dish with non-stick spray. 8 ounces shredded cheddar; reserve some for top of baking dish. 1. Preheat oven to 350˚. In a large saucepan cook onion in oil (5 minutes). Stir in spices. Add cream cheese, cook over low heat until smooth. Remove from heat, stir in olives and most of the shredded cheddar cheese. 2. Wrap all 12 tortillas in foil and heat in oven for 8 minutes. 3. Spread ¼ cup enchilada sauce over bottom of tortilla. Spoon 1/3 cup chicken mixture over sauce. Roll and place, seam side down in pan. Top with remaining sauce and cheese. 4. Bake 15 to 20 minutes. We had this salad tonight for dinner. Trying to change our ways slightly and make something that was NOT beige. They always say beige food is not the best for you. But, damn, it certainly is good! That being said this salad is pretty darn good! I made a few adjustments to the original dressing ingredients and I made it a bit sweeter. The sugar and the sesame seeds were not in the original recipe. In my opinion, the dressing was a bit bland. The other thought I had was to add a bit of toasted walnuts. I will try that the next time. 1. In a small sauce pan, bring the ½ cup water and drained mandarin juice to a boil. Add the balsamic vinegar and soy sauce and again bring to a boil. Add sugar (if the mandarin oranges are not in sweetened juice). Mix the cornstarch in a small amount of water and blend until it dissolves into a smooth liquid. Slowly add to the boiling mixture while stirring until the ingredients in the pan thicken. Add sesame seed, salt and pepper; to taste. Simmer for 3 minutes until the dressing is cooked (translucent). Allow to cool. 1. For each salad, on a large dinner plate, arrange chopped lettuce. Place sliced onions, cabbage, and julienned carrots on the bed of lettuce. Arrange thin strips of roast beef on top of the vegetables. Arrange mandarin oranges on top and add dressing. I should have realized back then. My destiny was written from an early age, except I didn't know it. All the signs were there. If I only knew then about my love for food and cooking. Oh, the things that I would have done differently. As you know from the story of my cornbread escapades, I did get involved with cooking at an early age. This involvement has continued every day of my life since then. Had I been smart, I would have gone to culinary school. People always said that I was so good at cooking. Did I think of that...Noooooo! Did I listen...Noooooo! Go to school for business and make oodles of money. That was the path I thought was right. 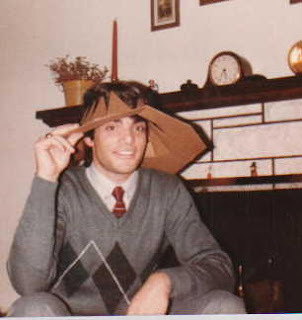 At sixteen, I remember the only things I asked for my birthday were a soup tureen, napkin rings and a wok. Really, at sixteen, that was the best I could come up with? Why didn't I see the signs then? How much more could I have been smacked in the face? In the picture you will see my joy at wearing the packing materials from my new wok. Now, don't get me wrong, I am happy with my life. And who knows, I could have gone to culinary school, become a chef and truly hated it. I sincerely doubt it but it could have happened that way. Here I am in my 40's thinking about the things I should/could have done. Some may say that it is never too late. And who knows, maybe someday? Throughout my life, my parents have always encouraged me in all of my endeavors. I just wonder what would have happened to me had one of us thought of this path. How would things have been different? What would I be doing now? Would I still love food? Would I weigh 100 pounds more? I can surely say that the answer to the last two questions would be “Yes”. So, I urge everyone; if you have an interest or passion in food, pursue it! Who knows it may be your dream come true! Did you know that you can revive stale potato chips in the microwave? Hate to waste food and throw away those chips? You can revive the crispness of those potato or tortilla chips by spreading them on a glass plate and microwave on high for 1 minute. After they come out of the microwave, place them on a double layer of paper towels and allow them to come to room temperature. I have been on a quest. Searching for the perfect no-fail brownie. Too many are very cakey or too fudgey. Now, whether you are a brownie with nuts, powder-sugared covered, or blanketed by frosting brownie lover, you can understand my quest. My mother used to make THE best brownies ever. After a long day at school, I can remember walking in the house and that chocolatey-fugdey smell would greet me at the door. Always warm out of the pan, these brownies had a wonderfully shiney top crust. I am a brownie lover who does not want nuts nor the frosting. Just plain with light dusting of powdered sugar. This is how she always made them. We were given one as her way of welcoming us home and a way of her showing her love for us. Now, unfortunaely for me, my mother is not the best recipe keeper in the world. Boxes, books, and paper bags stored the hundreds and hundreds of recipes she would collect. In my opinion, her brownies were the best. But, the recipe has disappeared into the vast collection she has or lost in one of her moves. I believe I have found a brownie recipe that has come closest to the blast from my past I enjoyed as a child. I tested this recipe as a dessert to bring to a party hosted by my very good friend from college, Carla. As fate would have it, Carla now works with Kevin. I will try these brownies again without the nuts to see how they match my mothers. Mom, if you are reading this....you best be looking for that recipe now! 1. Preheat oven to 325 degrees with rack in middle of oven. Line a 13x9-inch pan with foil. Use two pieces, one going in each direction. Leave approximately 2-inches overhang. Spray with non-stick cooking spray. 2. If using nuts, spread chopped nuts evenly on rimmed baking sheet and toast in oven until fragrant, 5 to 9 minutes. Set aside to cool. 3. Whisk to combine the flour, salt, and baking powder in medium bowl; set aside. 4. Melt chocolate and butter in large heatproof bow set over saucepan of almost-simmering water, stirring occasionally, until smooth. When chocolate mixture is completely smooth, remove bowl from saucepan and gradually whisk in sugar. Add eggs one at a time, whisking after each addition until thoroughly combined. Whisk in vanilla. Add flour mixture in three additions, folding with rubber spatula until batter is completely smooth. 5. Transfer batter to prepared pan; using spatula, spread batter into corners of pan and smoothing surface. Sprinkle toasted nuts evenly over batter and bake until toothpick or wooden skewer inserted into center of brownies come out with few moist crumbs attached, 30 to 35 minutes. Cool on wire rack to room temperature, about 2 hours, then remove brownies from pan by lifting foil overhang. Cut brownies into 2-inch squares and serve. Store in an airtight container. 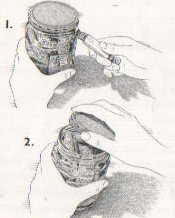 Did you ever find that sometimes jar lids are impossible to open? Tired of banging them against the counter? Running them under cold water? A sure fire way to open those stubborn jars is with a church key opener. 1. Fit the tip of the church key under the edge of the lid and gently lift the key to break the seal. 2. The lid should now be easy to unscrew. With sandwiches that turn out like this, I will never have to go to Taylor Street in Chicago again. These are a true winner! 1. Spinkle a bit of flour on a smooth, clean surface. Flip the steak on the flour a few times so it has some flour on both sides and then use a meat pounder to pound it to less than ¼-inch thick. 2. Mix together the egg and water in a wide, shallow dish. In a separate wide, shallow dish, combine the bread crumbs, parmesan, salt, and pepper. Pour 1/2-inch of oil into a large skillet and heat on medium high. Dip the steak into the egg mixture, turning and folding until it is fully moistened. 3. Then dredge it in the breadcrumb mixture, turning to coat it thoroughly. Slide the steak into the hot oil and cook until it is light brown, turning it once, about 4 minutes; do not let the steak brown too much. 4. Remove the steak from the pan, place it on paper towels, and instantly fold it up so it will fit inside the bread. Immediately place it in the bread and top it with the mozzarella. Pour on the marinara and add the red peppers as desired. You may want to pop it under the broiler for a minute to melt cheese a bit more. We all have done it. Some more than others. Tonight, part of our dinner was one of those times. I decided tonights dinner would be Breaded Steak Sandwiches with Roasted Red Pepper, Mozzarella and Marinara. Along side of this great sandwich, I thought a nice homemade hash brown would be the perfect accompaniment. I grated the potatoes and onion for the hash browns. I am happy to report that all finger tips and knuckles are still in tact. I mixed the potatoes and onion with salt and pepper, added butter and oil to the frying pan and began to cook the hash browns. I made a few mistakes in the process. Now, I can honestly say that I have had my share. My first mistake was the frying pan was not hot enough. If the oil/butter is not ready, all that will happen is that the potatoes will steam and not crisp up. This is a fairly common mistake and one that I consciously have to remind myself about. Always being in a hurry will often end up in disaster. A good sign that the pan is hot enough is that the oil/butter will shimmer in the pan. The second mistake, in my opinion, was grating the onion. Because the onion was grated and broken down, too much moisture was released too quickly. With more moisture in the pan, the hash browns did turn brown but there was no way they would get crisp. So, lessons learned? First, in trying not to risk the end result, take your time and be patient. Secondly, pay close attention to how the dish comes out and if you are not satisified, try and come up with a way to make it better. To paraphrase the words from one of my idols, Julia Child....Never, ever, apologize for your food! Anyone else have any horror stories? Active dry yeast and rapid rise (instant) yeast appear similar because both are envelopes of dried yeast. Substituting one for the other will produce different results. In kitchen tests, Cook's Illustrated magazine staff found using equal amounts of each in the same dinner roll recipe showed active dry took 50% longer to rise and baked denser than the rapid rise batches. The reason? Active dry yeast is dried at a higher temperature, which kills more of the yeast cells. Rapid rise yeast is dried at more gentle temperatures. Rapid rise yeast can be added directly into the dry ingredients without "blooming" the yeast in a water/sugar mixture first. Don't worry about not having rapid rise yeast though. You can substitute one for the other and produce similar results. If the recipe calls for rapid rise yeast and you only have active dry yeast, simply increase the amount of yeast you use. For example, if the recipe calls for 1 teaspoon of rapid rise yeast, you would use 1-1/4 teaspoon active dry yeast. Also, in this instance, remember to dissolve the active dry yeast in the water (heat water to 105 degrees) specified from the recipe. If sugar is called for in the recipe, add a small amount (1 teaspoon) to yeast/water mixture to "feed" the yeast and start the process. Let the yeast/water mixture stand for 5 minutes until bubbly. If the recipe calls for active dry yeast and you have rapid rise yeast, simply decrease the amount of yeast specified in the recipe. For example, if the recipe calls for 1 teaspoon active dry yeast, you would use 3/4 teaspoon rapid rise yeast. There is no need to "bloom" the rapid rise yeast. You can simply add it to the dry ingredients. And remember, DO NOT EVER be intimidated by recipes that call for yeast! Do you hear that mom? As long as you check the date on the yeast and it is fresh, you should have no problems with baking. This is a variation of a dish someone taught me a long time ago. Fast, simple and stick-to-your-ribs food. The balsamic vinegar is where my variation came into play. I thought it added a tangy sweetness that went well with the taste of the sauerkraut. If you can not find Frank's Bavarian Kraut. Substitute with regular kraut with approximately one tablespoon brown sugar (to taste). 1. Simmer bratwurst or polish sausage in water and beer until cooked; about 15 minutes. 2. Saute onions in butter and oil until translucent. (It may seem like a lot to saute in but you will need this when combining all ingredients). When onions are translucent, add the sauerkraut and caraway and simmer until heated through. Add approximately 1/8 cup of balsamic vinegar (reserve remaining 1/8 cup) and taste the mixture. Should have a note of sweetness to it. 3. Slice bratwurst or sausage into 1-inch chunks and add to onion/sauerkraut mixture. Add in the 1/2 teaspoon seasoning salt. 4. Add cooked noodles to bratwurst/onion mixture and stir well. Taste for seasoning. If necessary add the remaining balsamic vinegar and salt/pepper to taste. Heat through and serve. Most people would not want to spend their holiday vacation cooking. However, I am here to tell you that I get so much pleasure cooking while at the cabin. No question about it. Nothing fancy. Everything is simple. Due to space limitations, we had to purchase a small apartment-sized stove. We have hand-me-down pots and pans and limited utensils. There is a stand mixer and toaster oven. Everything is done by hand. Everything is done with love. The main reason I enjoy cooking so much when we are up north is because I can take my time, focus, and enjoy what I am doing. This past week, we ate out only once and that was take-out Chinese food. When in the kitchen at the cabin, the music is usually playing, a cocktail may be enjoyed and you will probably hear singing or humming. Anyone who has ever come for a visit knows that the kitchen is off-limits. Kevin will usually say that I am in my element and that you really should stand back. It is my pleasure to create a warm comforting feeling with the food I create. During the course of the week, some of the food included, baking a loaf of egg bread, We had french toast, enjoyed fresh biscuits and creamy sausage black pepper gravy. Dinners included spaghetti and meatballs, breaded chicken breasts with cauliflower casserole, baked porkchops with broccoli and roasted potatoes, and a great quick meal, Johnsville Chili Cheese Sausage links with dough wrapped in spiral fashion. Relaxation takes on many different forms. Some people sew, some read, and some exercise, my relaxation just happens to come cooking. Do what you enjoy and do it for those you love. What more enjoyment could you ask for?